Gyre Gold Chopper is a Switch Axe Weapon in Monster Hunter World (MHW). All weapons have unique properties relating to their Attack Power, Elemental Damage and various different looks. Please see Weapon Mechanics to fully understand the depth of your Hunter Arsenal. Weapon derived from the Kulve Taroth Monster. Styled with the Kulve Taroth Alpha Armor Set and Kulve Taroth Beta Armor Set. This weapon has 10% Affinity, 40 Defense, and Fire damage. This weapon also has Phial Type: Power. 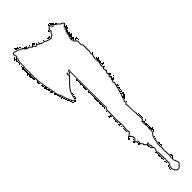 Gyre Gold Chopper is a special switch axe weapon that can only be obtained through the Banquet in the Earthen Hall quest, and cannot be upgraded.